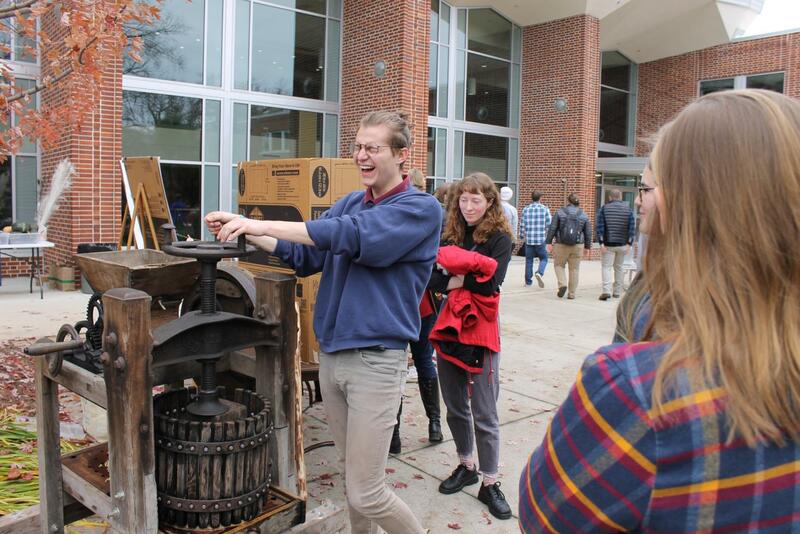 Sean McKenzie(‘20) utilizes the cider press. 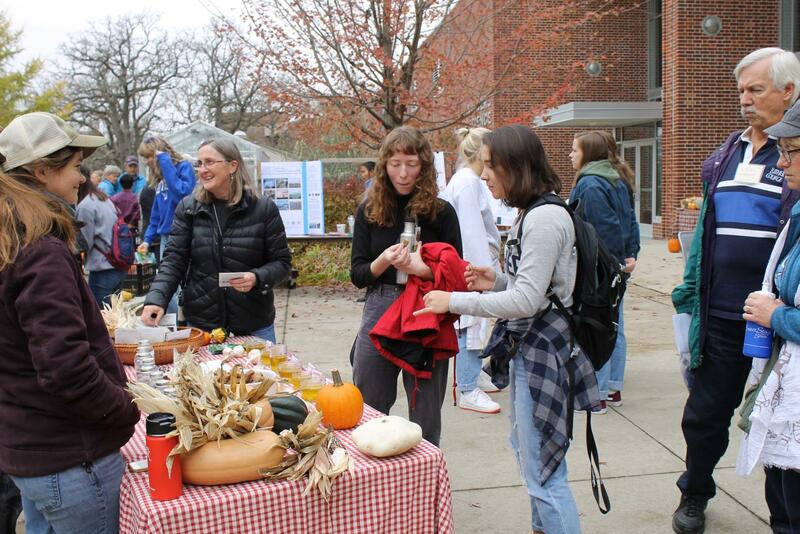 Luther alums, faculty, staff, and students gathered outside the Valders Hall of Science on Saturday Oct. 27 for the first Sustainability Harvest Festival, hosted by the Center for Sustainable Communities. 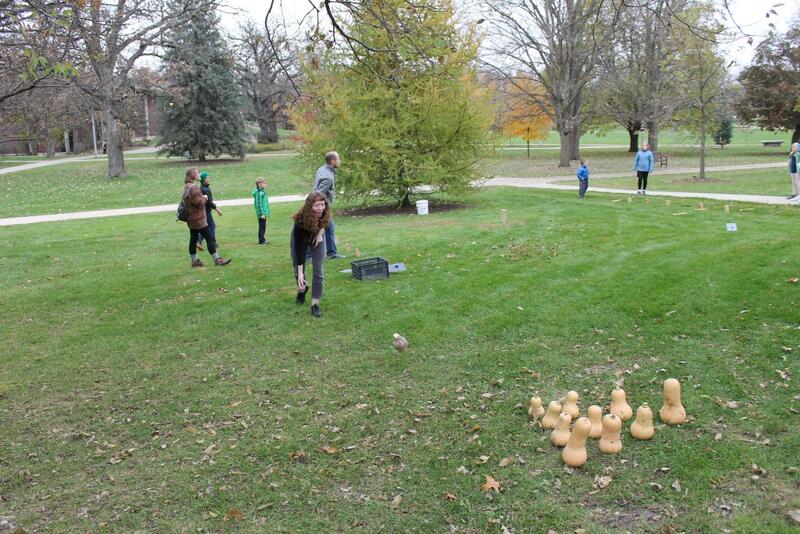 The festival engaged with community members through an array of events that included squash bowling, pumpkin carving, a cider press, kubb, and yoga. Green Iowa Americorp and Seed Savers also helped with the event. According to Sustainability Coordinator Toby Cain, the event’s goal was to connect community members with the Center for Sustainable Communities. Morgan Seemann (‘20) tosses a squash in sqaush bowling. Kim Chham (‘21) helped organize the festival by coming up with activities for the event, coordinating with the rest of the center, and arranging to bring in outside help for leading yoga and usage of the cider press. While the event promotes sustainability, it also promotes mental health according to Chham. In addition, having the Sustainability Harvest Festival on Homecoming weekend allowed the Center for Sustainable Communities to update alums on sustainability initiatives on Luther’s campus. Sean McKenzie (‘20) was excited to be able to interact with the alums. Morgan Seemann (‘20) and Lauren Leonard (’21) indulge in the harvest festival snacks while examining the table of options. The Center for Sustainable Communities also hopes attendees will incorporate changes into their daily routines to become more environmentally aware. Before the event, Cain described what activities the center planned to promote environmentalism both on an individual and global level. According to Chham, providing community engagement and education is important for the Center for Sustainable Communities to achieve their goals. In the future, the center will focus on teaching sustainability to students by promoting reusable energy, waste reduction, and energy consumption reduction and will hold events to promote these practices. Attendee Julia Simpson (‘20) said that the Sustainability Harvest Festival provided her with a better understanding the Center for Sustainable Communities’ work on campus. “I think it is very important for Luther students to come to these events to become more educated and to be more aware of the sustainable things that are happening around campus,” Simpson said.